L'Armée de l'Air essaie toujours de soulever des doutes au sujet des pilotes qui occasionnellement défient le black-out et témoignent de leurs observations d'OVNIs dans la presse publique. Par exemple, il y a eu le cas célèbre de Killian de 1959, un incident qui s'est produit avant que le black out ait semblé être entièrement effectif. Summary: The sighting of three glowing objects by several airline crews February 24, 1959 is one of the most thoroughly investigated (and, ironically, one of the most controversial) on record. The key witness, Capt. Peter W. Killian, was interviewed by NICAP personnel. A detailed investigation report, including weather data, air navigation maps, etc. , was submitted to NlCAP by the New York City Affiliate. The Akron UFO Research Committee co - operated in the investigation, adding valuable details. Captain Killian and First Officer James Dee, American Airlines, were flying a DC-6B nonstop from Newark to Detroit. It was a clear night, with stars brightly visible and no moon. At 8:20 p.m. EST the plane was approximately 13 miles west of Williamsport, Pennsylvania, flying on a heading of 295 degrees at 8,500 feet. Off the left wingtip, Captain Killian noticed three bright lights, which he first thought were the three stars making up the belt of the constellation Orion. But then he realized that Orion was also visible, higher overhead. The UFOs were about 15 degrees above the plane. As he and F/O Dee continued to watch, the objects pulled ahead of the wingtip. At this point, in the vicinity of Erie, Pennsylvania, Captain Killian contacted two other American Airlines planes in the area. One at the Dolphin checkpoint (over the northern shore of Lake Erie) saw the objects directly to the south over Cleveland. The other aircraft, near Sandusky, Ohio, and headed toward Pittsburgh, spotted the objects a little to the left of their heading, to the southeast. As the DC-6B continued west, the UFOs occasionally pulled ahead and dropped back until they were in their original position with respect to the left wingtip. Then Captain Killian began letting down for landing in Detroit, and the crew no longer had time to watch the objects. During the 45 minute observation, the UFOs continuously changed brightness, flashing brightly "brighter than any star," and fading completely. This did not occur in any apparent pattern. The color fluctuated from yellow-orange to a brilliant blue-white at their brightest. The last object in line moved back and forth at times, independently of the generally western motion of the formation. Visibility was unlimited. The pilots agreed, "It could not be any clearer than it was that night above 5,000 feet." When the plane began letting down for landing, about 9:15 p.m., Captain Killian and F/O Dee lost sight of the objects. At 9:30 p.m. in Akron, Ohio, George Popowitch of the UFO Research Committee received a phone call from a contact at the Akron airport. A United Airlines plane (Flight 937) had just landed for a 15-minute stop, and reported sighting three UFOs which had followed their plane for 30 minutes. Popowitch had already received 9 reports from local citizens between 9:15 and 9:20 of three UFOs seen in the area, so he arranged to interview the crew of the airliner. Captain A.D. Yates and Eng. L.E. Baney said they had tracked the objects from the vicinity of Lockhaven, Pennsylvania, to Youngstown, Ohio, between 8:40 and 9:10 p.m. United Airlines Flight 321, also, had discussed the objects by radio. Captain Yates had seen the UFOs pacing his plane to the south. But in the vicinity of Warren, Ohio the objects passed the aircraft, veered to the right, and finally disappeared to the northwest. Capt. Killian with two hostess (also witnesses). In this photo Killian has in his left hand a model of an American Airlines DC-6. Capt. 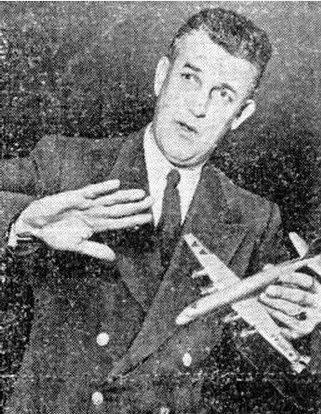 Peter Killian, American Airlines pilot, was one of several pilots who reported observing three UFOs above Pennsylvania, Feb.24, 1959. (See Section V). While traveling westward across the state, Capt. Killian and the other pilots saw the UFOs flying a parallel course to the south. The Air Force later stated that the pilots had seen Air Force bombers refueling from a tanker aircraft. Reconstructing the sighting (see map), it is possible to trace a hypothetical, but very consistent, picture of the UFOs' flight path. Around 6:20 to 6:40 p.m., from Central Pennsylvania, the UFOs were observed to the SSW paralleling the westerly course of the airliners. Their distance, of course, is unknown. But based on subsequent observations, it is a reasonable supposition that the UFOs were over southern Pennsylvania, in the vicinity of Pittsburgh and Johnstown. Around the same time that Capt. A. D. Yates, United Airlines, saw the UFOs turn and head northwest in the vicinity of Akron, three American Airlines pilots simultaneously saw the objects (8:55 p.m.). Their lines of sight converge on the Cleveland- Akron area. By 9:20 p.m., the Akron UFO Research Committee had received reports from ground observers, describing three UFOs headed west. Capt. Killian continued to observe the UFOs until he began his landing approach at Detroit, about 120 miles northwest of Akron. "The investigation of this incident revealed that an Air Force refueling mission, involving a KC-97 and three B-47 aircraft, was flown in the vicinity of Bradford, Pennsylvania, at the time of the sighting by Capt. Killian. The refueling operation was conducted at 17,000 feet altitude at approximately 230 knots true air speed (about 265 mph) for a period of approximately one hour." (1) Bradford, Pa., given as a geographical reference point for the refueling mission, is north of the flight paths of the American and United airliners. All the pilots saw the UFOs to the south. If the refueling mission actually took place over southern Pennsylvania (which would have to be the case to account for the reported facts), why wasn't Pittsburgh or Johnstown given as a reference point? Bradford is virtually the full width of the state away from the apparent location of the UFOs. (2) Triangulation shows that (from the line of Capt. Killian's flight path in Central Pennsylvania) the tanker and other aircraft would have to be within 12 miles of Capt. Killian's position for a sighting angle of 15 degrees to place them at approximately 17,000 feet altitude. Even allowing for a 1/3 error in estimation of angle, the aircraft would have to be within 20 miles to the south of Capt. Killian. This is inconsistent with the observation by Capt. Yates, farther to the south, who also saw the UFOs to his south as he traveled all the way to the Pennsylvania-Ohio border. (3) Triangulation of the simultaneous sighting by the three American Airlines pilots is even more damaging to the tanker explanation. The three lines of sight converge on the general Akron area, where ground sightings also tend to confirm the distance from Capt. Killian's aircraft. From the position of Capt. Killian's plane at the time of the simultaneous observation, the distance to Akron is approximately 70 miles. (4) The American Airlines pilots checked after landing and learned that no jet tankers were in the area. (Taped statement by copilot on file at CSI, New York). Capt. Killian is also quoted by the Air Force as stating that a check with Air Traffic Control showed no three aircraft in the area (see below). (5) Several aspects of the Air Force handling of this case suggest a desire to explain it away, including issuance of typical counter-to-fact explanations. Before any representatives of the Air Force contacted Capt. Killian to obtain his report, the Air Force first suggested he had been fooled by the belt of the constellation Orion seen through breaks in the overcast. (There was no overcast). This statement was issued from ATIC three days after the sighting. An anonymous spokesman implied that UFO witnesses often proved to be drunks (N.Y. Herald-Tribune; March 1, 1959). On March 20 (more than three weeks after the sighting) the Air Force issued a statement from Washington alleging that the airline pilots had seen a refueling mission. (One critic of the USAF UFO investigation wryly suggested to NICAP that it took the Air Force three weeks to locate some of its own planes). The refueling mission explanation has since been given all inquiring Members of Congress. Departing Newark 1910 arriving Detroit 2252. It was approximately 2045 I noticed these three lights off my left wing in the vicinity of Bradford, Pennsylvania. I was flying 8,500 VFR on top of broken clouds. Visibility was unlimited with no upper clouds observed. It was extremely difficult to ascertain the distance of the lights. The color of the lights were from a yellow to a light orange. The intensity of the lights also changed from dim to a bright brilliant. Sometimes the interval of the three lights were identical to the Belt of the constellation Orion. Occasionally the rear lights lagged somewhat behind. Also changed altitudes. During the 40 minutes of observation, the three lights occasionally came forward from a 9 o'clock position to 11 o'clock position and then fell back to the original 9 o'clock position. Also occasionally the lights extinguished completely alternating from one to another, sometimes the whole three were extinguished and during this whole operation, as I mentioned before, the lights changed in intensity. This motion was not only seen by myself but four crew members and passengers on board and also by two other airplanes in the area. The only possible explanation other than flying saucers could be a jet tanker refueling operation. Never having witnessed refueling operation at night, I am not aware of the lighting of the jet tanker. My air speed during this complete flight was 250 knots indicated. I also do not know the air speed of tankers during operation if this could be so. I contacted ATC to find out if they had any airplanes on a clearance and no three airplanes were given. In attempting to resolve the contradictions, NICAP once again telephoned Capt. Killian. Mrs. Killian stated to the NICAP Director that Capt. Killian had been instructed not to say any more about the sighting. She indicated he was angry about being silenced, and felt his rights were being denied. Officially, the case has been "explained" as a refueling mission. The facts obtained before Capt. Killian was silenced (including his own public denial of that explanation), the above triangulations, and the type and timing of the Air Force statements all cast doubt on the validity of the explanation. Though it may seem far-fetched to those unfamiliar with UFO history to suppose that the Air Force would have any motive for a deliberate cover-up, the former chief of the Air Force UFO project, himself, reported many similar incidents. A good parallel to the Capt. Killian sighting is described by Capt. Edward J. Ruppelt (Report on Unidentified Flying Objects, ppg. 119-120). When a report came in from airline pilots that their plane had been buzzed by a cigar-shaped object as they were taking off from Sioux City, Iowa [See Section V; 1-20-51], Capt. Ruppelt witnessed the reaction by Air Force investigators. The sighting was treated as a joke; the "investigator" merely located an Air Force bomber near Sioux City and blamed it for the sighting. Capt. Ruppelt acknowledged the absurdity of this answer: a bomber buzzing an airliner in an airport traffic pattern. There was no investigation; only an arbitrary and counter-to-fact "explanation". On the night of February 24, 1959 a scheduled American Airlines flight from Newark to Detroit encountered three lights over Pennsylvania. The initial detection took place at 8:20 PM when the aircraft was 13 miles west of Williamsport. and the lights remained at about the 9 o'clock position for 40 minutes, providing an opportunity for many of the 35 passenger to observe them. They were also observed by the crews of two other planes flying much farther to the south, as well as by the tower operators in Pittsburgh. PA. The information content of this sighting is low, as all we have is three non-point lights changing relative position and separation, with intensity fluctuating from bright to fade-out and color variable from yellow-orange to brilliant blue white. The case made headlines and threw the Air Force into a frenzy, with an escalation of explanations which included the suggestion that those who report flying saucers--including Capt. Killian and his passengers-- usually had one too many. The refueling mission explanation was finally adopted; containing some attractive features, it was accepted by the press and the case passed into oblivion. However, a scientific and more detailed re-examination of the BB files shows that the Air Force was more eager to produce an explanation, any explanation, than to find out what really happened. The lights reported by Capt. Killian on February 24, 1959 were explained by Blue Book as having a very simple cause: a refueling mission. But we know after years of studying the files that the Air Force had a knack for picking out from all the tentative explanations the one that was practically impossible. This leads me to the following question: postulating that a mission was on that night: do the data provided by Capt. Killian and other pilots support that hypothesis? The first one is the statement by Capt. Killian that "the altitude of the objects was 30 degrees above my horizon" (Ref. 1). The second is the information that KC-97 refueling missions are flown at 17,000 ft. It is then easy to make an order of magnitude calculation to determine the distance "a" from the plane to the lights reported by Capt. Killian, without any precise knowledge of the exact position of the aircraft or the lights. We can assume with a small error that "a" is the hypotenuse of a right triangle in which the distance from the lights to the ground is h = 17000 ft. while A is the angle between the line of sight and the tangent to the horizon. The value A = 15 degrees was included because it is mentioned sometimes in the literature, as for example in Ref. 8, where one can find some rough attempt at a similar analysis. The other values are added for completeness, to show how little an error in angular elevation affects the results. The values in the last column of the table are obtained using that formula. But the fact is that the wing span of a B-47 is 116 ft., while for the KC-97 tanker it is 141 ft., so in all cases the lights of the planes would have been resolved and the aircraft positively identified. This was not the case, as all that was described by Capt. Killian and the other witnesses on Flight 139 were three lights in loose formation. Of course, if the planes were far enough away, the lights of each would have appeared blended into one, but the numbers in the table indicate that the distance required is of the order of more than thirty nautical miles, which does not satisfy the data. It could be argued that Capt. Killian committed a gross error in estimating at 30 degrees the elevation of the lights above the plane, but even if the elevation was only 10 degrees, the distance was about 16 nm and the lights would have been resolved. Moreover, we are told of three lights, not four, although there were four aircraft. The inescapable conclusion is that the refueling mission, if any, was either much higher and/or much farther away than stated. This is not possible either, as for the refueling both aircraft must decrease speed which can only be accomplished by decreasing altitude. The stated altitude of 17,000 ft. is in agreement with the design parameters of the aircraft involved. The same limitations on the distances are equally valid for the other aircraft reporting lights that night. For example, Capt. Yates' plane was too far south to see the lights of a refueling mission observed at the same time by Capt. killian. Yet he reported that at 9:00 PM something heading northwest crossed his flying path near Youngstown. OH (Ref. 8. p. 116). In addition. observers in the ground near Akron, OH reported lights moving east to west west at 9:15 PM (Ref. 8). from the official files we know that a refueling operation was over Pittsburgh at 8:40 PM, (Ret. 4) and a look at the map indicates that the three observations fit quite well; thus, what Capt.Yates saw and reported was very likely that specific refueling mission. Before he was silenced - and there is no question about that either (Ref. 9, p. 15) Capt. Killian provided quite a bit of information expanding on his original statements. In one of them (Ref. 9, page 3) he says: " At first, I estimated that the objects were not over a mile from us. This was just an impression: / be/ieve now that they were not that close". No. they weren't that close. but they were not very far away either, if we can trust the AF data about refueling missions! moon size: d = 316 ft.
quarter at arm's length: d = 987 ft.
diameters which seem a bit too large, for had they been planes, with a constellation of lights to boot, at a distance of 5.6 nm the identification would have been immediate. Perhaps Capt. Killian was bad at estimating angular sizes, or perhaps he was trying to express that the lights were not point sources. But what is clear is that he did not observe a refueling mission near or far. The most damaging argument against the refueling mission hypothesis is the manner in which the AF changed its explications for the incident. In the first release (Feb. 28), the lights were the Belt of Orion, simply because Capt. Killian had used it as a model of what he saw. A few days later (March 1), some nasty remarks were made to the press about inebriation and UFO sightings (Ref. 11). And the third story was the refueling mission, released March 16, although the files show that the AF knew about it since March 2 at least (Ref. 4). Somehow the AF felt threatened by Capt. Killian's persistence that he had seen what he saw. After a point his statements to the press stopped, but his wife was not silenced, and she revealed that pressure had been exerted on American Airlines and that the company had ordered Capt. Killian to cease and desist, which he did. The Blue Book files are silent about the testimony by other commercial pilots, and the information provided by other sources (Ref. 8) is not detailed enough for evaluation; besides, our purpose is to analyze the incident based only on the official information. The official files contain, nonetheless, a report that has some bearing on this matter. On the evening of February 2, 1959, about three weeks prior to the Killian incident, a distinguished professor at the University of Michigan and his wife were driving on the Ohio Turnpike near Sandusky. OH. The sighting was reported to the FBI in Detroit, which transmitted the information to the Air Force in Washington DC, and then to Selfridge AFB in Michigan, which in turn, passed it on to ATIC in Dayton, OH, on February 25, 1959. Evidently, on that precise date ATIC was not very receptive to any information supporting even remotely the Killian incident (Ref. 6). Curiously enough, the files contain only a retyped copy of the original FBI report (Ref. 7), where we learn that the witnesses described what they saw as a "yellow thing", which had an upper part much like the top of a sphere, while the lower part was rather level or flat. Other tantalizing details are provided, such as the presence of the silhouette of a conventional aircraft departing in the opposite direction. This report is relevant for at least three reasons: 1) the location is in the area of the 24 Feb. sightings, as shown on the map appearing on page 116 of reference 8; ii) because the witnesses are unimpeachable; this I know firsthand, as I was acquainted with the professor many years ago when I was a student at the University of Michigan; and iii) and perhaps the more important, the expedience with which the AF dismissed the incident without remorse (Ref. 6). The above discussion has shown that the incident described by Capt. Killian was almost certainly not a refueling mission, although it is easy to understand the irresistible appeal that such a solution had for the Air Force analysts, in their ignorance of the possible methods for testing its viability. It is a beautiful example of the underhanded techniques used by the Air Force to discredit reliable witnesses. The official explanation is therefore untenable, and the proper classification for this incident should have been "UNEXPLAINED". (1) Memo prepared by Capt. Killian dated February 24, 1959 with reference to Flight 139 and transmitted to the Air Force by AMERICAN AIRLINES. This Memo has been reproduced many times, but often with the last paragraph omitted (Example; UFO EVIDENCE, p. 116). or with two paragraphs added emphasizing the refueling mission explanation (Example: enclosure in Ref. 5). The original document ends with the words "Distance away is unknown" and is not signed. The important item is: "The altitude of the objects was 30 deg. above my horizon." (2) Letter addressed to Mr. Fred A. Kirsch dated 19 March 1959 and signed by Lawrence J. Tacker. Major USAF, Public Information Division. Provides details about refueling missions, indicating inter alia that KC-97's fly at an altitude of 17000 ft. at 230 knots TAS. (3) Memo to ATIC dated 14 Aug.1959 and signed by R. F. Werkmeister, Major USAF. Administrative Officer. (4) Undated Memo addressed to ATIC Commander, Dayton, Ohio, signed by William D. Hostutler. Capt. USAF, Administrative Officer. This document is in reply to a telephone call received at 08:20 on March 2, 1959, and confirms that at 20:40 hrs, 24 February (0140Z, 25 Feb.) three B-47's from the 772nd ACW Sq. were on a refueling mission near Pittsburgh, PA as reported by the tower operators. (5) Letter to Ms. Frances Ryan dated 24 June 1959 and signed by Lawrence J. Tacker. Major USAF. Public Information Division. (6) Memorandum to ATIC Commander, Dayton. OH. dated 25 Feb.1959 and signed by P.E. Chancy, Major, USAF, Administrative Officer. (7) Memorandum to SAC by S.A. Coghlan dated February 4, 1959. Coghlan apparently was an FBI agent in Detroit. The document now in the BB files is not the original, but an unsigned retyped copy. (9) REPORT ON UFOs observed Feb.24, 1959 by AMERICAN-UNITED airline pilots. Compiled by Unidentified Flying Objects Research Committee, Akron. OH. undated. (10) Menzel, Donald H. and Boyd, Lyle G: THE WORLD OF FLYING SAUCERS. The final galley proofs of the pages dealing with the Killian case are part of the official Blue Book records. (11 ) "'Flying Saucers' Sightings Still Get Air Force Study", in the March 1, 1959 issue of the New York Herald Tribune under the byline of Ralph Chapman. The sighting of three glowing objects by several airline crews February 24, 1959, is one of the most thoroughly investigated (and ironically, one of the most controversial) on record. On February 24, 1959, Captain Peter W. Killian and First Officer James Dee, American Airlines, were flying a DC-6B nonstop from Newark to Detroit. It was a clear night, with stars brightly visible and no moon. At 8:20 P.M. (EST) the plane was approximately thirteen miles west of Williamsport, Pennsylvania, flying on a heading of 295 degrees at 8,500 feet. Off the left wingtip, Captain Killian noticed three bright lights, which he first thought was the three stars making up the belt of the constellation Orion. But then he realized that Orion was also visible, higher overhead. The UFOs were about 15 degrees above the plane. As he and Flight Officer (F/O) Dee continued to watch, the objects pulled ahead of the wingtip. At this point, in the vicinity of Erie, Pennsylvania, Captain Killian contacted two other American Airlines planes in the area. One, at the "Dolphin checkpoint" (over the northern shore of Lake Erie), saw the objects directly to the south over Cleveland. The other aircraft, near Sandusky, Ohio, and heading toward Pittsburgh. spotted the objects a little to the left of their heading, to the southeast. During the forty-five minute observation, the UFOs continuously changed brightness, flashing "brighter than any star," and then fading completely. This did not occur in any apparent pattern. The color fluctuated from yellow-orange to a brilliant blue-white at their brightest. The last object in line moved back and forth at times, independently of the generally western motion of the formation. Visibility was unlimited. The pilots agreed: "It could not be any clearer than it was that night above 5,000 feet." (Flight 937) had just landed for a fifteen-minute stop and reported sighting three UFOs which had followed their plane for thirty minutes. Popowitch had already received nine reports from local citizens between 9:15 and 9:20 of there UFOs seen in the area, so he arranged to interview the crew of the airliner. Captain A. D. Yates and Engineer L. E. Baney said they had tracked the object from the vicinity of Lockhaven, Pennsylvania, to Youngstown, Ohio, between 8:40 and 9:10 P.M. United Airlines flight 321, also, had discussed the objects by radio. Captain Yates had seen the UFOs pacing his plane to the south. But in the vicinity of Warren, Ohio, the objects passed the aircraft, veered to the right, and finally disappeared to the northwest. On May 6, 1959, Major General W. P. Fisher, Air Force Director of Legislative Liaison, in a letter to Senator Harry Byrd, stated: "The investigation of this incident revealed that an Air Force refueling mission, involving a KC-97 and three B-47 aircraft, was flown in the vicinity of Bradford, Pennsylvania, at the time of the sighting by Captain Killian. The refueling operation was conducted at 17,000 feet altitude at approximately 230 knots true air speed (about 265 mph) for a period of approximately one hour." (1) Bradford was to the north of the airliner's flight path; the UFOs were seen to the south. (2) Triangulation’s of the pilots' sighting did not conform to the altitude and position information given for the refueling operation. (3) The American Airlines crews checked with Air Traffic Control at the time and were told that no three aircraft were in the area and, after landing, were told that no jet refueling tankers were in the area. Queried by the press, Captain Killian said: "If the Air Force wants to believe that, it can. But I know what a B-47 looks like and I know what a KC-97 tanker looks like, and I know what they took like in operation at night. And that’s not what I saw." par le commandant Peter w.killian. Celui-ci amorce un demi tour pour éviter la collision. une déclaration a la presse. Je n'ai jamais rien vu de semblable...."
les O.V.N.I avec des étoiles. au dessus des nuages et que la visibilité était parfaite. de l'air qui soutient , cette fois que Killian était ivre! Mais la carrière de Killian est brisée. la fin d'une carrière de pilote. Killian a remis en cause cette prudente politique . black-out observée par l'U.S air force." si vous le jugé complémentaire. Merci Beaucoup Claude je vais fusionner les sujets.